Hi everyone! We have a great deal for those stopping in at the shop on Father’s Day – Sunday, June 21, 2015. 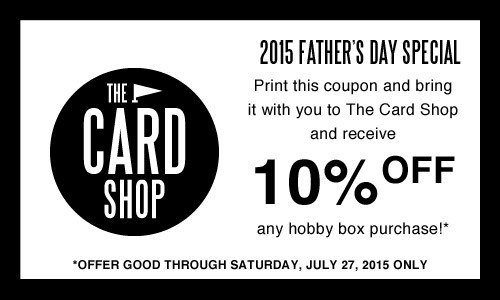 Print out this coupon to get 10% Off any hobby box purchase. The coupon is good through Saturday, June 27, 2015. Thanks for all of the support and I hope to see you on Father’s Day!